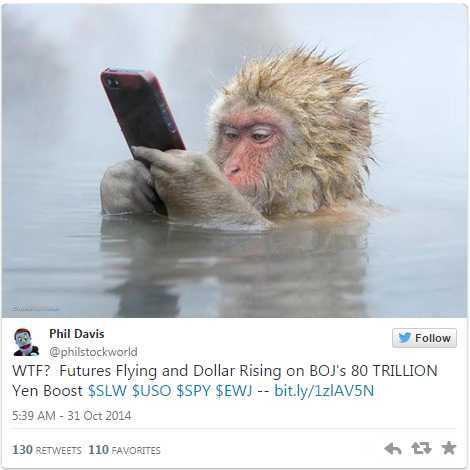 The shorts are certainly getting a scare this morning as the BOJ hands out another $124Bn (yes, we did the relative math in this morning's Alert to our Members) and that was more than enough to pop the Nikkei 5% in 90 minutes, with the /NKD Futures now testing 16,850 – almost catching up to the Dow for the 3rd time in 2 years. Unfortunately, each time the Nikkei has matched up with the Dow's gains, it's marked and overbought top and led to a sell-off so we were forced to officially reverse our long call on Russell Futures (/TF) from yesterday morning's post and flip short at 1,169 (with tight stops over 1,170). That's OK though because a move from 1,132.50 to 1,169 on /TF is a profit of $3,650 per contract – not bad for a day's work, right? See, I told you we could pay for your trip to our Las Vegas Live Seminar next week with a Futures trade! Not that we advocate holding Futures positions overnight – it could just have easily gone the other way. That's what Wednesday's TNA spread was for – the longer-term long position on the Russell, which will pop TNA well over our $80 goal this morning – that trade has a 316% profit potential in less than a month! We decided to give yesterday a pass. 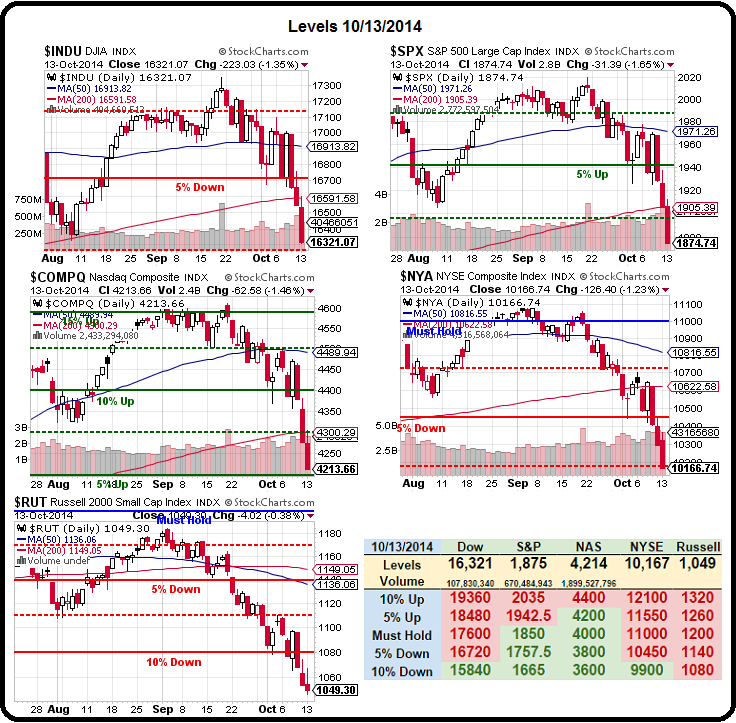 Dow 16,466 (weak) and 16,632 (strong). S&P 1,878 (weak) and 1,903 (strong). 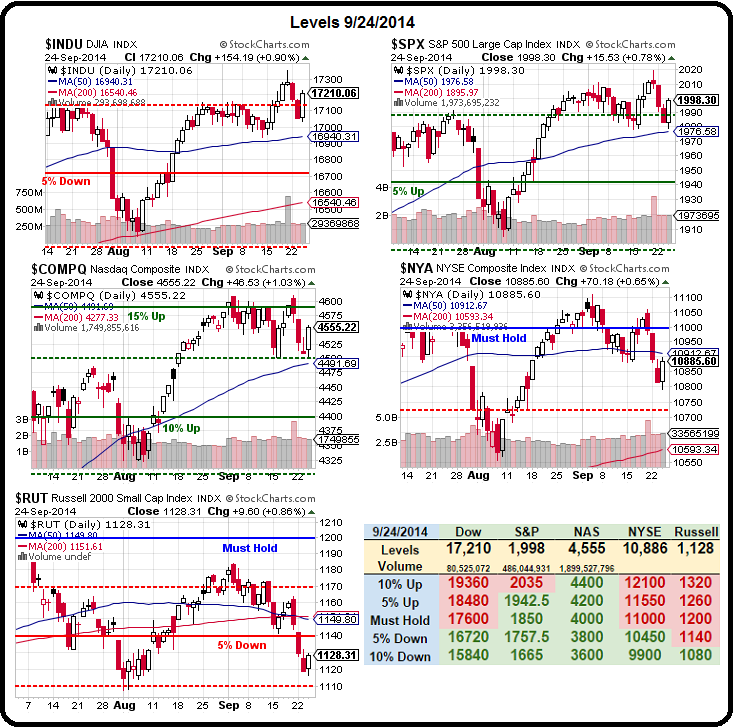 Nasdaq 4,280 (weak) and 4,360 (strong). NYSE 10,360 (weak) and 10,540 (strong). Russell 1,104 (weak) and 1,128 (strong). So the Dow fell almost exactly from it's strong bounce to it's weak bounce yesterday. Aside from confirming the 5% Rule™ is firmly in charge, holding the weak bounce line is bullish – IF it holds. The S&P and Nasdaq held their strong bounce lines (thanks to AAPL) while the NYSE stayed in it's range but the Russell was a big disappointment and failed the weak bounce – a very bad sign if they can't take it back today. Nothing came of yesterday's Ebola hearings. 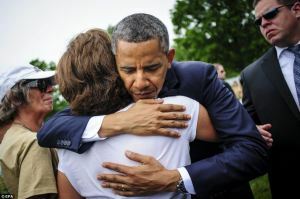 Here's a picture of President Obama hugging it out with one of the nurses that treated one of the Ebola patients – a strong image for the people as calmer voices begin to prevail – on that front at least. Markets were also boosted by dovish talk from the usually hawkish Jimmy Bullard, of the St. Louis Fed, who said the Fed should consider delaying plans to end its bond-buying program at the end of this month to halt a decline in expected inflation. This is what it sounds like when Doves cry at the Fed and, like Prince's mother, the markets are never satisfied but, for this morning at least – we're taking back those weak bounce levels that we told you we'd take back by Friday. “The recovery from the lows after Bullard spoke yesterday is another reminder how addicted markets still are to liquidity,” said Deutsche Bank strategist Jim Reid. “The Fed can certainly help markets but perhaps we really need the ECB to step up a gear for a true recovery,” he added. Still, manipulated or not, this gives us two nice reversal days on strong volume and we couldn't be happier as we flipped very bullish in our Short-Term Portfolio and should be able to take full advantage of this rapid recovery. Whether or not we maintain that bullish stance into the weekend depends on how our bounce levels hold up today (see Tuesday morning's post for our amazingly accurate predictions of the week's action). Keep that in mind when I tell you there is nothing particularly bullish about hitting the weak bounce on the Friday of a drop week – it's merely better than the alternative of FAILING to make those weak bounce lines. That would have been BAD!!! Meanwhile, those of you who took our FREE Trade Idea from yesterday's morning post to go long the Russell at 1,050 (the same line we were watching on Tuesday) are now sitting on $4,000 PER CONTRACT gains and I do so hope you are not greedy and set your stops at the 1,090 line. This is why we use hedges – they kept us from stopping out of our long positions during the dip and, since our long positions pay off in a flat or up market, anything not down is VERY profitable for our Long-Term positions, which outnumber our bearish Short-Term hedges by 10:1 in our Income Portfolio and Long-Term Portfolio. 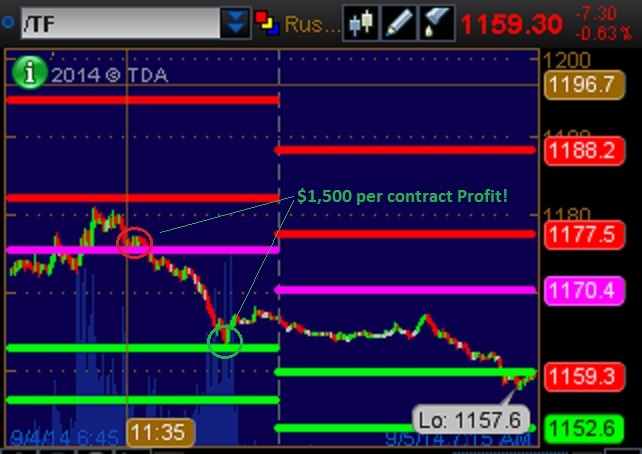 $1,500 Friday – Yesterday’s Futures Play Pays Big! That's $2,200 in two days playing with us! That's why, today, right now, we are once again shorting the Futures at 17,100 in /YM(Dow) and 2,005 on /ES (S&P) and 1,175 on /TF(Russell). Yesterday we shorted the Nasdaq(/NQ) at 4,100 – a trade idea I outlined in the morning post for our subscribers – and that trade made $700 per contract by noon. Not a bad day's work, right? 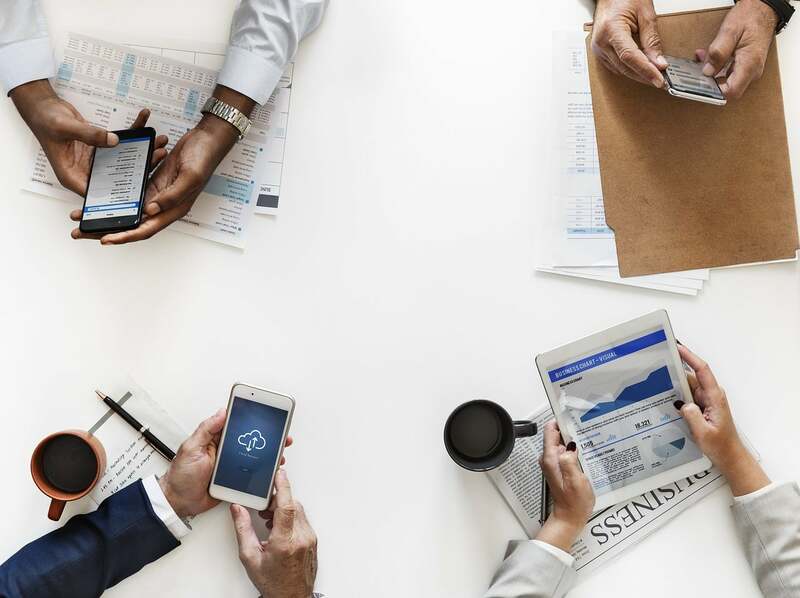 Futures trading is a useful skill as we can make adjustments to our trading almost anytime we get some new information – even when the market is closed. We played bullish on Draghi fever early in the morning and then, in our Live Member Chat Room, at 10:35, we nailed the turn for a re-entry at 1,180 on the Russell (/TF Futures), 17,150 on the Dow (/YM) and 2,010 on the S&P (/ES) as well as $95 on oil (/CL) and we were rewarded with moves down to 1,160 (+$2,000 per contract), 17,025 (+$625 per contract), 1,990 (+$1,000 per contract) and $94.25 (+$750 per contract). As I said yesterday, we can make trades like this because the market is RIGGED and we understand how it's rigged, which enables us to play along and profit from the manipulation. We don't like it, we don't endorse it but, since it happens every day – we may as well bet on it, right? 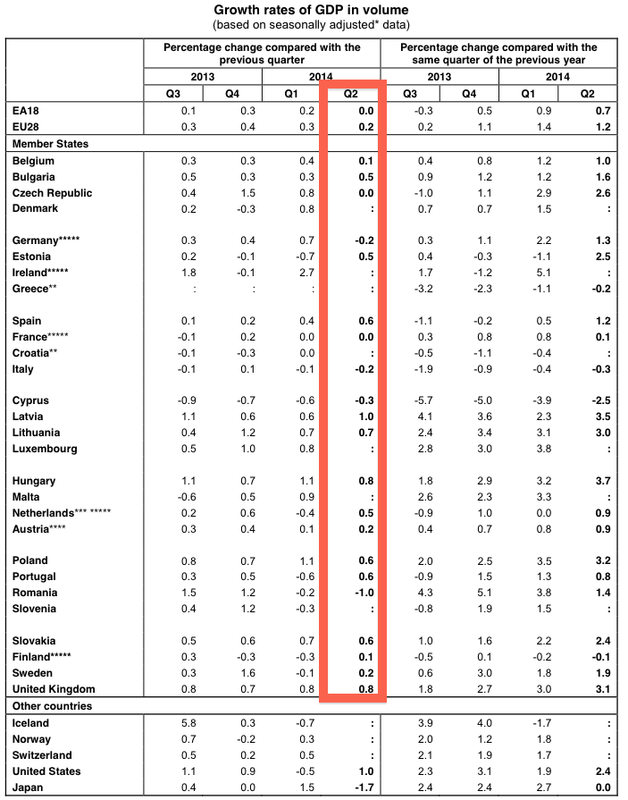 Italy, Romania and Cyprus are in Recession (2 consecutive negative quarters) and Belgium dropped 75%, Czech 100% (to zero), Germany down 130%, Latvia down 85%, Hungary down 30%, Poland down 45%… These are NOT GOOD numbers! Yesterday we got a -1.7% reading on Japan, down over 200% from last quarter's +1.5%. Our own GDP grew at just 1% from last Q, which itself was down 0.5% from the quarter before it but, fortunately, last year's Q2 was so terrible that, by comparison to that – we improved by 2.4% – and that somehow made people happy. The euro zone's three largest economies, which account for two-thirds of the region's €9.6T ($12.8T) GDP, all did not post any growth. 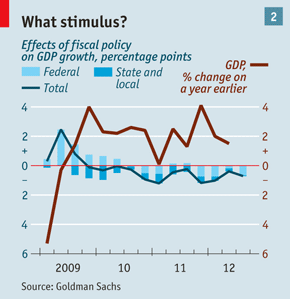 German GDP shrank 0.2% from the first quarter and Italy's output fell at a similar pace. The French economy, the bloc's second largest behind Germany, stagnated for a second straight quarter. 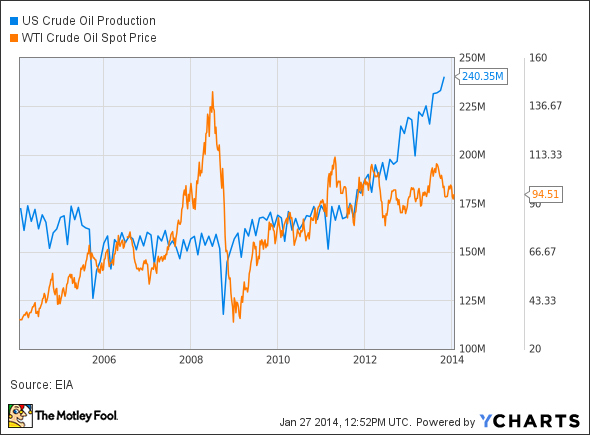 How, exactly, does this translate into a bullish signal for the markets? The answer is: It doesn't. The bullishness is nothing more than anticipation of MORE FREE MONEY over longer periods of time and that is, indeed good for our Corporate Citizens and the top 1% Human Citizens lucky enough to own them (we own lots in our Long-Term Portfolios!) as they are able to refinance debt at record lows and buy back their own stock with free money and buy whole other companies with free money – all supplied their friendly Central Banksters as well as the suckers who put their hard-earned cash into banks and bonds at 1% interest. That's right, the yeild on the German 10-Year Bund has dropped to 1% today. Auntie Angela will hold $1M of your money for 10 years and give you back $1,100,000 when she's done – isn't that FANTASTIC! It sure is for those of us who get to borrow that money – not so much for people trying to save. Actually it's a rule of thumb at PSW that dip buyers need to get burned 3 times before they wise up to a proper correction, so they still have at least another try in them before they finally walk away from this crazy market. 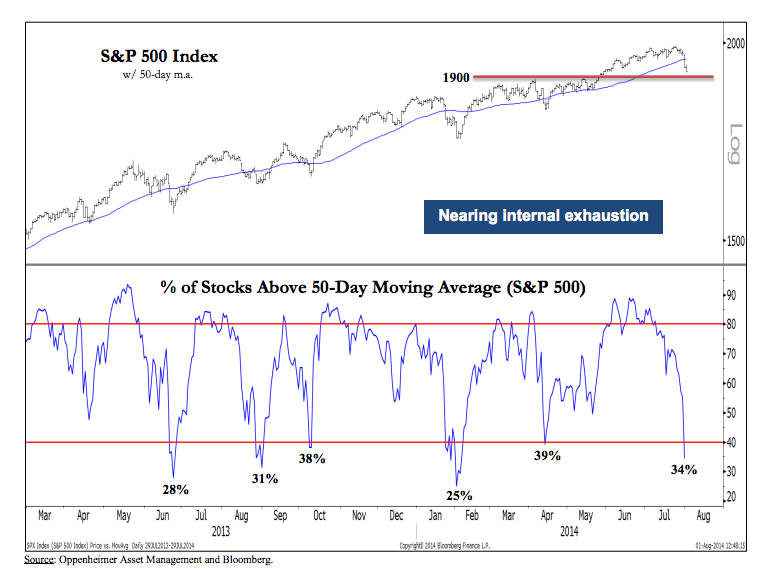 As you can see from Oppenheimer's S&P chart, 56% of the S&P has plunged back below their 50 dma in the past 30 days. Short-term, we're certainly oversold but we'll be very critical of a low-volume recovery until we see those 50 dmas retaken on the indexes. Those are way up at 16,877 on the Dow, 1,954 on the S&P, 4,368 on the Nasdaq, 10,912 on the NYSE and 1,160 on the Russell. 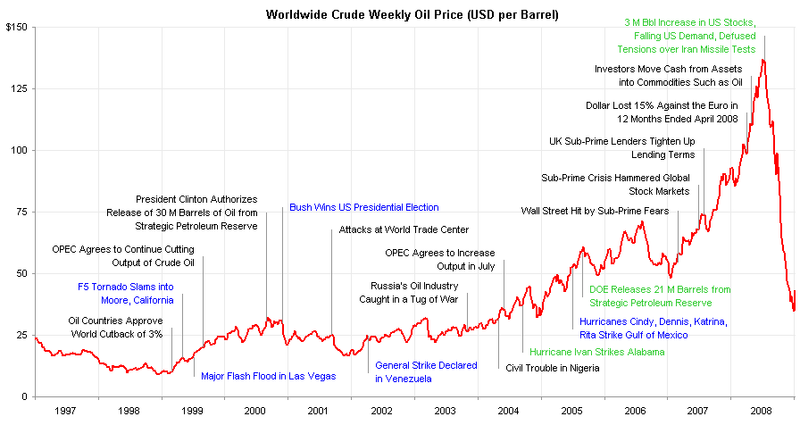 Anything less than that and there's nothing to be particularly bullish about. That doesn't stop us, of course, from picking individual short-term longs. 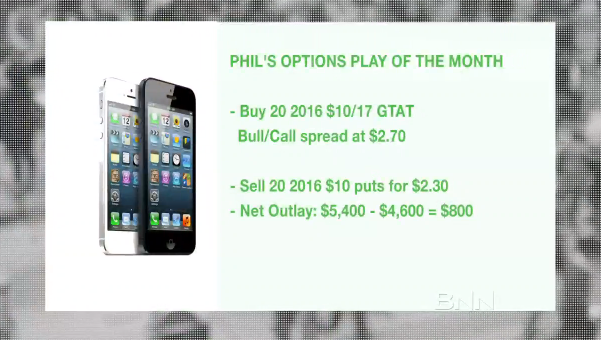 On Wednesday, for example, I was on TV on Money Talk and we featured this play on GTAT as my "Options Play of the Month." Last night, GTAT knocked it out of the park on earnings and the stock shot up over 10% to $15+ already in pre-market trading. That will put us well on track to the full $14,000 return on this spread and a 1,650% gain on cash ($13,200 profit on the $800 we invested)! Not bad for a few day's work, right? By the way, if you never want to miss trade ideas like GTAT again – sign up right here for Membership and you will be among the first to hear about our new trade ideas every day! That's the basis for this rally – or what's left of it – as we see this pattern almost daily: A big(comparatively) volume sell-off followed by a "rally" on 1/3 to 1/4 of the volume that sold and then, once we hit a pre-programmed peak (about where we got to in the no-volume Futures), we have a bit of volume selling into the close. This is how you can see those charts that show all the "smart money" running out of the market, even as the market goes higher. Why would they leave? Why would anyone leave this exciting market? The answer is, because those fund managers are well aware that, at some point, the music will stop and there will be no buyers to save them then. Best to get out now and avoid the rush. That time was also "different," wasn't it? We had invented the Internet (well, Al Gore did) and easy monetary policy led to bank mergers and NAFTA ushered in an era of free trade that send tens of millions of jobs overseas, causing profits for US Corporations to soar and those good times were never going to end – until they did. It's very hard to say when a rally like this will finally run out of gas but, when we stop making new highs and we have these BS daily, manipulative run-ups to cover the selling – that's probably a good time to get more cautious. As noted on Dave Fry's S&P chart, it's ALL about the Fed and how much FREE MONEY the Fed will pump in and how long they will keep pumping it in, etc. You would think we'd be tired of the same old song and dance but why should we, when we GET PAID to join in?